Eat Confident Foundations — Eat Confident Co.
give yourself the life-changing gift of confident eating. Confidence is the missing piece in your relationship with food, and we want to help you get it back. Master the foundations of confident eating…without counting, meal plans, food rules, or programs…EVER AGAIN. No more second guessing your food choices, stressing out about food, hopping from one system to the next, or feeling confused about where to start. We’re here to walk you step-by-step through all the essentials you need to know to finally become the confident eater you want to be. APPLY FOR EAT CONFIDENT FOUNDATIONS TODAY! Eat Confident Foundations will equip you with all the essential skills to get you feeling confident + empowered around food. 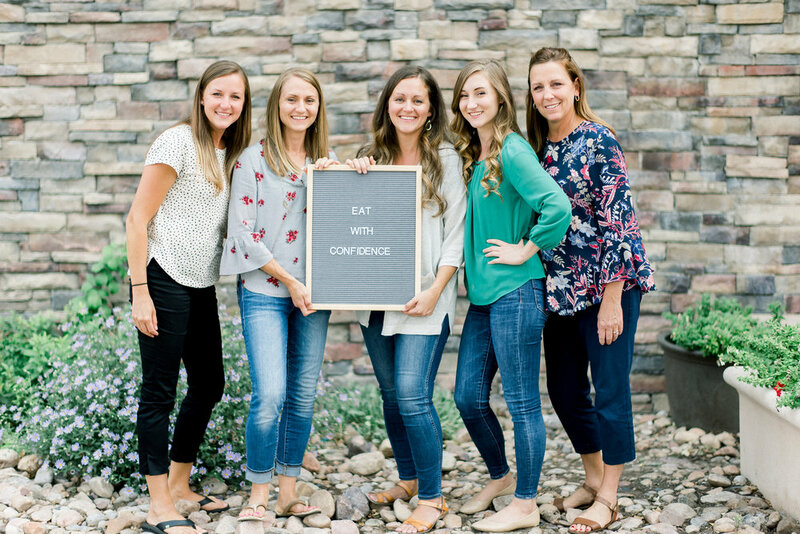 Eat Confident Foundations is an 8-week, small-group, step-by-step coaching program that walks you through the 8 essential steps to becoming a confident eater. let us give you the step-by- step tools you need to succeed…and our expert guidance as you practice. eat confident foundations will run MAR 4 - APR 26, 2019. I’M ALREADY FAMILIAR WITH A NON-DIET APPROACH TO WELLNESS. WHAT WILL I GET FROM THIS PROGRAM THAT I CAN’T GET BY LEARNING ON MY OWN? We certainly hope you are familiar with our approach - that’s why we’re interested in having you join us in this program! And if you’d rather do this on your own, we wish you all the best. But here’s a question for you: where has doing it yourself gotten you up to this point? Chances are, you’ve spent many hours (not to mention dollars) on trying to find solutions to your food problems. And we hope you’ve learned some valuable lessons through all those experiences. But the benefit of having someone else hold your hand and walk you along the path is that it saves you a lot of guessing, mistakes, and more wasted time. Doing it on your own, quite simply, takes longer and is much harder than allowing someone who has been where you are to guide you to the other side. The only way to become a confident eater is to master both the skills AND the strategies to get you there. And this is your chance to do that with us to help you along the way. We are not handing out a download or telling you to go read a book and figure it out. We’ll be walking beside you, pointing out potential pitfalls, trouble-shooting concerns that come up, and supporting you as you practice and apply the skills + strategies to your own life. This is your chance to learn from us, because we’ve been where you are, and we know how to walk you to the other side. I CAN’T AFFORD TO SPEND MONEY ON THIS. MAYBE THIS WILL BE JUST ONE MORE FAILURE. We know how frustrating it can be to feel like you’ve tried everything and nothing has changed. Investing money in yourself is not something we take lightly, and we hope you don’t, either! Investing in yourself is essentially your commitment to put some skin in the game. To dedicate your money, yes, but also your time and energy to getting the help you need in getting where you want to go. If you’ve spent thousands of dollars over the years on meal plans, diet bets, weight loss challenges, and more, we understand your hesitancy to open up your wallet yet again. The thing that you’ll take away from THIS program, however, is different than anything else you’ve tried. It comes with the understanding that once you learn what we’re teaching, you’re free. You’ll no longer need to buy meal plans or programs anymore, because you’ll have all the skills you need to rely on YOURSELF. You will become the expert on your own body, and you’ll know exactly what to do to take amazing care of yourself - without every relying on a prescriptive, rigid plan again as long as you live. WHAT’S THE DIFFERENCE BETWEEN EAT CONFIDENT FOUNDATIONS AND EAT CONFIDENT COLLECTIVE? Eat Confident Collective is our monthly membership group coaching program. All of the principles taught in our small-group programs are covered to some extent in the Collective. However, because of the large size of the group and the vast variety of people, personalities, and struggles, we felt we needed a place to work with women more closely who wanted more hands-on guidance than we can give in the Collective. Small-group coaching, like Eat Confident Foundations, has the added value of being a more in-depth, fast-paced, intensive coaching experience with much more input + feedback from us along the way. In the small group format, we are also able to move through concepts much more efficiently and get you to a point of mastery much more quickly. The group is smaller, the individual feedback is greater, and the experience is more concentrated. WHAT HAPPENS AFTER I FILL OUT AN APPLICATION? We will review all applications to make sure we are forming a cohesive small group of individuals with similar goals. If we feel like you’d be a good fit, we’ll reach out through email to send you the link to register. This application does not signify commitment - only that you are interested in being considered - and you will not make a payment until you’ve been accepted into the program. ready to join us? let’s do this! if you already know this program is just what you need, click below to apply. remember - space is limited and we will only be accepting 4 people into this in-depth coaching experience. so don’t miss it! registration closes FEB 28TH.